The Weekly Writing Challenge was to write about Pie. I have to admit that the closest I have ever come to making a pie was the scores of mud pies my sister, brother and I made, and let me tell you, we got pretty creative with them. We tried different dirt, different consistencies and even used some of Mom’s kitchen items to prepare them. They sported berries, leaves, grass and rocks and looked so tempting, we even tasted them a time or two. Seriously, I never cared for pie much so I never learned to make them. There were a couple of exceptions. 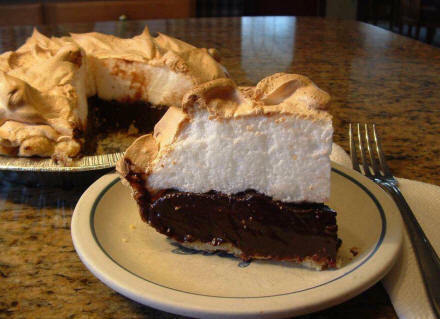 My late paternal grandmother, aka Granny, whom I have written about in many posts, made a chocolate pie with meringue piled high that was delicious. Granny wasn’t the Suzy Homemaker type. She fed her family, but she didn’t don an apron just for the fun of it most days. She would to teach one of us how to cook something, because she would do anything we wanted to do as long as it wasn’t dangerous, but she didn’t have any aspirations about being Martha Stewart. However, just the mere mention of her making a chocolate pie was enough to have me looking forward to dinner time and licking my lips at the thought of that comforting chocolaty classic. The light-as-air, lightly toasted on top meringue was heavenly too. I am not sure why I don’t possess this recipe and have never tried to make, but I will have to rectify that post haste. Many of my relatives made the Florida favorite, key lime pie. Although it is good, I always much preferred chocolate anything to the tart taste of this one. We always had the traditional pumpkin and pecan pies at Thanksgiving and Christmas, but the fudge and red velvet cake won out for me! My mother made a pie she referred to as green pie although that is all I recollect about it. I remember when I was a teenager that one of my sister’s boyfriends loved the pie so much that he would beg her to make it. She often did and made it for him on his birthday. I don’t even recall what the ingredients were or how it tasted because back then, again, it just wasn’t my thing. I am finding that the older I get, my taste for pie is increasing, so I guess I should be thankful for this prompt because I believe it has inspired me to try my hand at pie making. Maybe this Thanksgiving my guests will get to taste a real homemade apple pie, with caramel drizzled on the top and sporting a perfectly browned buttery flavored crust. At the very least, I will make the chocolate pie.